At 5 years old, I was too young to play in the first years of the OPHL but my dad, seeing the need to keep me involved got me a sweater with the number 1/2 emblazoned on the back and dubbed me the 'mascot'. It was my job to slide around the rink on my bob-skates before the start of evey game day, A very big deal for a five year old. The league didn't seem that big of a deal to me at the time, I had no idea of the impact it had, and would have, on the community over the next 40+ years. It fast became a way of life in our house during the winter months and even more, Dad's passion. He would recruit good friends like Phil Catalano and Vernon Woo to officiate, probably telling them it was short term but little did anyone know how long it would go on. The league needed sweaters, Nathan Kleinman stepped up and provided enough to epuip four teams, at no cost to anyone, and did so for many, many years after; the reason OPHL's "Stanley Cup" is known as the Nathan Kleinman trophy. The efforts put forth by Dad, Phil, Vernon and the countless parents, neighbors and family was staggering. I would be remiss if I didn't give credit to my Mom, who put up with Dad and the 20-30 strange kids he had lacing up in the basement every week because it was too cold out in the park. Remember, it was 'back in the day' so it was actually 45 below and we had 12 feet of snow...until May. Special thanks to my brother Dan for keeping the league going strong for all these years. also Sue, Sharon, and everyone who put any time from minutes to years, in on this endeavor. YOU HAVE ALL DONE SOMETHING TRULY GREAT. 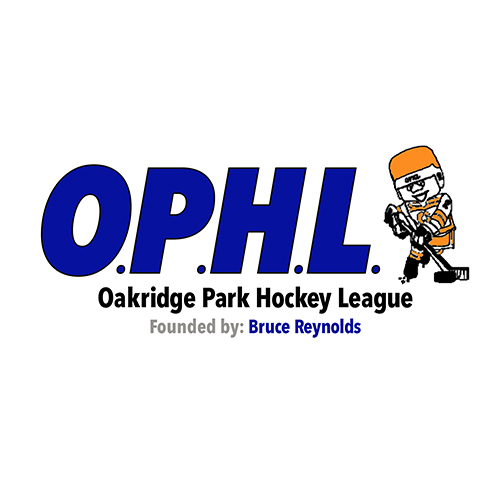 I played until I was 'past my prime' in OPHL years and without a doubt, they were some of the best of my life. What a fantastic opportunity for young hockey players! I'm keeping my fingers crossed that there will be room for my daughter for the 2009/2010 season. YAAAA first place two years running!!!!!!!! you better keep it up next year when I'm gone!!!!!!!! I still have the light blue OPHL jacket in even better condition. I still remember scoring my first goal during the pre game practice. I played for the bombers in 1979 when i was 7. I still have my sweater and it's in great condition. My mom just told me that hockey does not start for another few months...that stinks...I wish it started now!! If anyone is getting a group together for a practice game or just for having fun...please call my mom, Betty (905) 286-5289, cause I want to PLAY HOCKEY!!!
" O.P.H.L. ",WHAT A CONCEPT. WHEN MR.BRUCE REYNOLDS FOUNDED THE LEAGUE IN 1969, WHO COULD OF IMAGINED HOW MANY PEOPLE IT TOUCHED & THE LEGACY THAT BEGAN. MR. BRUCE REYNOLDS-PRESIDENT & MY FATHER MR. PHILLIP CATALANO-VICE PRESIDENT & REFEREE IN CHIEF, WITH MY STEP-MOTHER MRS. BRENDA CATALANO-SECRETARY-TREASURER, O.P.H.L. HAD CREATED TRUE HOCKEY SPIRIT. WITH MY FATHER'S LEVEL 4 REFEREE SKILLS WE TRULY HAD, GREAT OFF SIDES, PENALTY, AND ICING CALLS. THE RINK STARTED AS 1 FOOT BOARDS & EVOKED TO COMPLETE 4 FOOT BOARDS. AS I LOOKED BACK AT MY OFFICIAL PROGRAM OF 1973, I PLAYED FOR THE PORTWAY PIRATES ( YELLOW SWEATERS ) AS MY FIRST TEAM. I NOTICED MY NO. 27 AND REALIZED LATER ON IN LIFE IT WAS ALSO ONE OF MY FATHER'S REFEREE NO. 'S FOR THE M.T.H.L.. TO REMEMBER THE PLAYERS, AND EVEN THE ONE'S MY FATHER TRAINED TO TAKE OVER THE REFEREEING INCLUDED; MR. VERNON WOO, ANTHONY VASSELLO, GREG REYNOLDS, GUY WOODS, & GREAME REYNOLDS. TO REMEMBER MY COACH ROSS McGRORIATY ( PORTWAY PIRATES ) & MY FUTURE COACH ROBERT SPECK FOR THE BUNSDEN BOMBERS WAS NOSTALGIC. THE 1973 COACH MR. BILL McILROY I MEET ON A BUSINESS LEVEL MANY YEARS LATER IN MY LIFE. MY FATHER'S COMPANY PAID FOR AN AD IN THE " 1973 OFFICIAL PROGRAM " IN SUPPORT. MR. REYNOLD'S FAMILIAR CALL " CHANGE THEM UP, CHANGE THEM UP, 3RD LINE, 3RD LINE. " IS REMINISCENT IN MY MIND. TO HAVE A PLAYER ON MY TEAM WITH NO HAND, AND SEE THAT HIS FATHER FASTENED THE GROVE TO THE STICK AND PADDED THE GROVE INSIDE SO HE COULD SHOOT, PRODUCED PROBBLY THE BEST WRIST SHOOT IN OUR LEAGUE. THE TROPHY I WON ( MOST IMPROVED PLAYER ) I BELIEVE WAS LESS TO DO WITH MY HOCKEY SKILLS, AS WAS WITH MY CHARACTER. THE GREATEST PRIVILEGE OF ALL WAS TO SHAKE MR. REYNOLD'S HAND & THANK HIM, WHEN DEDICATION ARRANGEMENTS TO CHANGE THE NAME OF THE PARK TO BRUCE REYNOLDS OCCURRED. HE WAS UNFORTUNATELY NEAR THE END OF HIS LIFE WHICH HAD BEEN TAKEN TOO SOON. I HAVE THE ORIGINAL HOCKEY JACKET & O.P.H.L. PUCKS, AND BELIEVE MY FATHER WOULD BE HONOURED TO PRESENT THE CATALANO CUP AT THE FINALS NEXT YEAR. " HOCKEY " CANADA'S GAME---------KEEP UP THE GREAT WORK. !!!!!!!!!!!!!!!!!!!!!!! !